The weather is starting to warm up, and I thought it would be fun to make a home decor project that would welcome SPRING. I used my Fairy Girl Pure Innocence for the main image. I just love her. SO sweet. She is stamped on watercolor paper (SU) with PTI black ink and embossed in clear. I used SU reinkers and an empty aquapainter to watercolor her (I water down the ink in a palette instead of filling my water brush). 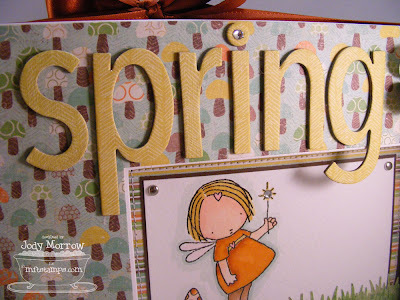 The word Spring, was die-cut using my SU Sizzix alphabet. I used heavy weight kraft chipboard and adhered Crate patterned paper to it using Xyron before I die cut the letters to make it easier and more polished. 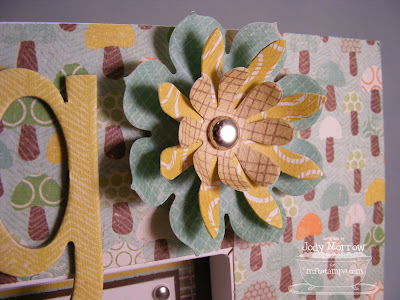 I die cut the flowers using the same patterned paper and a SU Sizzix flower die. I laid them all out, alternating colors and then adhered them together with a large brad. Then, I fluffed each one, by molding the petals with my fingers. Oh Jody, this looks terrific! Your coloring skills are FAB! Love that alphabet too, and I like the effect of using DP on the frame. A reall winning project! oh how cute!! what a sweet image! 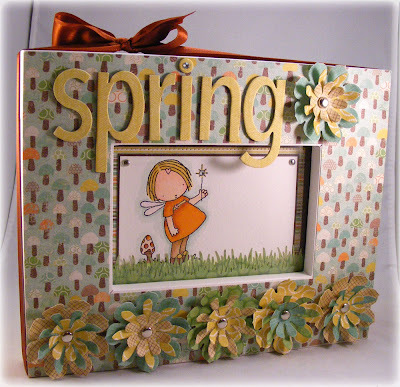 perfect for welcoming spring! thanks for the inspiration...i just got home from a spring decor purchasing trip...and one of these little frames would be another great idea! you're the bomb! What a lovely card!Love the depth and the stamp! Wow Jody!! Just gorgeous! I love all the dimension and the crystal on the "i". That paper is just so perfect! this is adorable!! 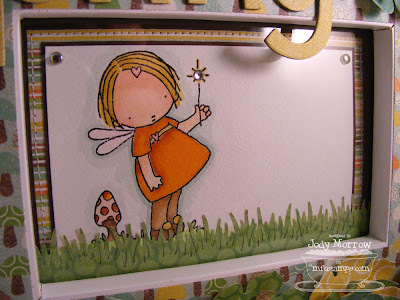 I love the grass, and the little fairy girl is one of my favs!! And the bow on the top is just perfect! Fabulous project girl! Love your watercolouring and that grass is awesome! Another punch that I need, because of you ;) ha! Thanks for inspiring me to get out my aqua painter! I think I'll do that today! Seriously girl, you rock! Look at the dp on the frame, totally matches! Cute, Cute, Cute!! Great project!! Lovin all the details and that dp with this PI is perfect!! oh it's so lovely and filled with perfect details!! what an awesome class & what lucky students! Wow! You are so.. creative. 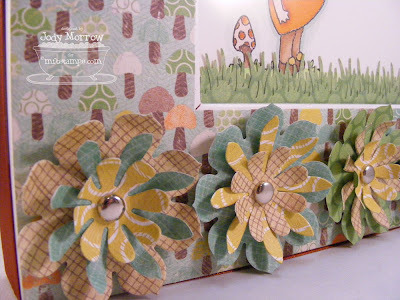 That project is simply adorable.I love the flowers. I check out your blog daily. How do come up with your ideas?